A couple of years ago we replanted our garden using mostly indigenous plants. The reward has been threefold – we use less water, the plants thrive in the natural soil but best of all are the gorgeous sunbirds which come in to dine on the nectar plants. They are like treasured jewels flitting about as their iridescent colours glint in the sunlight. 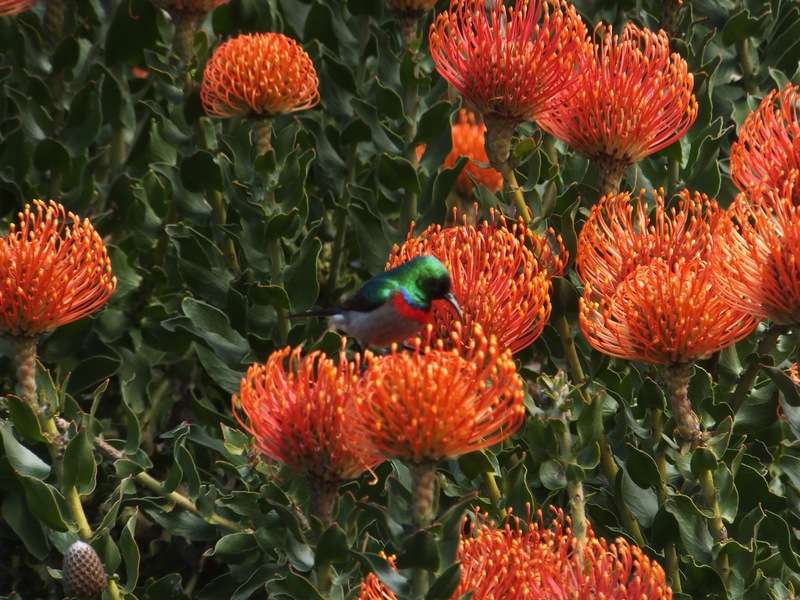 Here a handsome red collared sunbird sups from a leucospermum cordifolium bush. I like that a lot! The bush and the bird. Is this a perennial? Thanks, Seeker – glad you like our thriving nature. Locally the plant’s known as a one of the ‘pincushion’ varieties – yes they’re perrenials. I’ll check out the garden centre. Thank you. I love leucospermum with it waxy orange flower. We used to get it as a cut flower when I was a florist. The sunbird indeed looks like a flying jewel. Gorgeous! Oehoe!! Hierdie is werklik baie mooi. Thanks for the comments, Tina. Isn’t it rewarding to see the results when the ecology of a habitat all comes together. Well done on your conservancy work.